Last weekend, there were hailstones, thunder, frost on the roofs in the morning and temperatures in single figures. Today, it's 20°C, I've been for a long, lovely walk, and as soon as I've sent this newsletter I'm going to grab my writing utensils, a book or two and a cup of tea and head out into the garden. After seeing it snow more often in April than we did all winter, it's now getting green outside. The thorns are in full bloom and the tulips and bluebells are out. And when we went out exploring a couple of weeks ago - even though it was jolly cold - we even spotted snakeshead fritillaries. 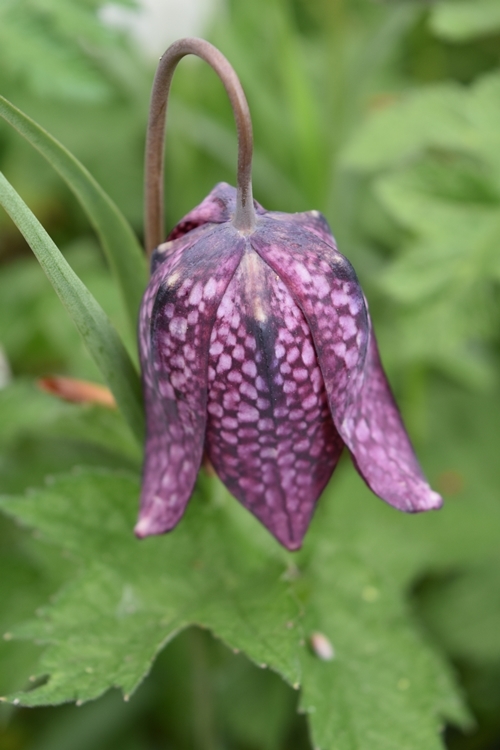 The meadows around Cricklade in Wiltshire - close to where we used to live - are famous for fritillaries, and I was chuffed to find them growing up in our neck of the woods, at Ascott House. The next time you find yourself on the border between Buckinghamshire and Bedfordshire, and especially if it is spring, put a visit to Ascott House on your to-do list. Ascott is a hunting box with extensive gardens, owned by the Rothchilds' family and looked after by the National Trust. And it's a real must-see place. Being a hunting box, the house would have been used most during the winter months, and the gardens were designed to be wonderful and amazing at a time when little else is. Visit in the spring and you can wander fields of daffodils and admire thousands (literally!) of tulips in the Dutch Garden. There, the planting is formal and orderly. In the meadows it's not. Separating the formal from the free-spirited are wonderfully cut hedges and trees that look their best in the winter and spring. Water features and sculptures add interest and this is definitely a garden where it pays to turn around every few steps and look backwards for unexpected views. The way this garden has been designed is amazing. 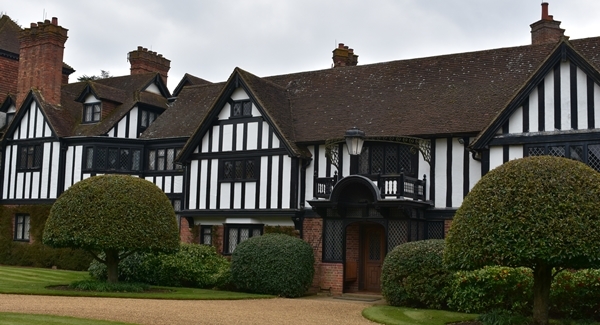 Ascott House looks pretty in its brick and half-timbered style, sprawling at the head of the gardens. It's open to visitors between March and September and still used by the family during the hunting season, so maybe this is what makes it so special, what gives Ascott House such a wonderfully warm, inviting vibe. Yes, it's brimming with artworks. There are paintings by Stubbs and Reynolds and Gainsborough. There's a wonderful collection of Chinese porcellain and there's some amazing furniture. But this wasn't what made Ascott House special for me. I love stories and this house had plenty to tell. When you visit, make a point to talk to the room stewards. Make sure you take a look at the back of the hidden door in the library - and do read the titles of the books! And unless you know your Ming vases from your Tang pottery, make sure you ask the guides about them. I loved the colours of the pieces, but I would have missed the oldest, most valuable item in the room until I had it pointed out to me. Why? Because compared to all the other pieces, it looked so thoroughly modern! Photography is not allowed inside the house to protect fragile fabrics and paintings, so you'll have to take my word for it that Ascott House is lovely. Or better yet, visit and see for yourself! This year sees the 950th anniversary of the Norman invasion of England, an event that changed England like few others before or since. It was a battle between three players that had started years earlier and that came to an end in October 1066. At the heart of the fight lay a crown and the rule over one of Europe's most sought-after realms. Anglo-Saxon England was a civilised, prosperous land and its aging king had no direct heir. Some say Edward the Confessor had promised the crown to William, duke of Normandy. William was certainly of that opinion. Others, most notably the Norwegian king Harald Hardrada, had no qualms to take the crown by force. But neither of the two was present when Edward died on January 5th. Harold Godwinson, earl of Wessex and the most powerful of Edward's court, was crowned on January 6th 1066, promoted to the honour by England's ruling council, the Witan. With only a tenuous claim to England's crown, Harold had to expect trouble. And trouble wasn't long arriving. At this time, 950 years ago, William, duke of Normandy would have been gathering men and resources to his banner. He would have been petitioning the Pope for intervention, since - according to him - Harold had earlier sworn to support William's bid for the English crown. Most of all, though, William would have been building ships. A whole fleet of ships that would take him and his army across the channel. But this is a story for next month's newsletter. And I can never let that pass, even though the farm closest to us was last week selling asparagus brought in from Herefordshire, since theirs isn't quite ready for cutting yet. I'm hoping the slight delay to its start will make the season last longer, and we have had our first asparagus dinners - so I'm well content. I love this time of year, since most foodie magazines are full of recipes for asparagus, fresh peas, broad beans and strawberries. All things I love to eat and love to cook with. The asparagus recipes veer between the tried and traditional and the increasingly outlandish, but that's fine. We'll eat all our favourites first and then, if there's still something of the season left, we can start experimenting. And yes, we can eat asparagus three times a day! Breakfast? Of course. Treat friends and family to a splendid brunch simply by serving toasted English muffins, topped with lightly griddled, thin spears of asparagus and a poached egg, and coated with Hollandaise sauce. Lunch? Toast a slice of bread and rub lightly with garlic. Sit on a large plate. Griddle enough asparagus to cover the toast. Shave parmesan flakes over the top. Drizzle with your bestest, greenest olive oil and your most expensive, treacle-thick balsamic vinegar. Serve olives on the side. Dinner? I can almost write a book here, but spears too thick to be griddled without burning work well sliced in a creamy risotto. They go equally well with gnocchi in garlic cream. Or bake them in the oven and serve very simply with lemon and parsley butter and toasted breadcrumbs, alongside a dish of buttered Jersey Royals. It's asparagus season - and we're loving it! I'm not quite sure what's on my to-do list for next month. The suddenly stunning weather has surprised us a little. Exploring more of England is certainly on the list. Meanwhile, please keep well, and I'll be back next month!